Massage treats the most common kinds of pain with the most natural form of medicine, (human Touch). The first written records of massage therapy were in China and Egypt, about 4,700 years ago. Massage has evolved over 5,000 years. Civilisations in the East and West found that natural healing and massage could heal injuries, relieve pain, and prevent and cure illnesses. There are approximately five million touch receptors in our skin 3,000 in a finger tip. Each time, when we get a massage, our brain receives the sensation because our skin cells send the nerve signal from skin to brain. This is one of the reasons a therapeutic massage is so good for mind, body and spirit. In a ‘Trust Me, I’m a Doctor’ BBC Two, Episode 5. ‘Doctors teamed up with Prof Fulvio D’Acquisto, an immunologist from the University of Roehampton and the Bodyology massage school. Fulvio found that massage boosted the number of white blood cells in patients suffering from HIV, a disease that causes a reduction in a type of white blood cell known as T.Lymphocytes to see is massage might have the same effect in people without serious immune conditions. A group of people, in a study each had a blood sample taken and analysed for the number of T.Lymphocytes present. This was for a baseline reading. They were asked to lie down and relax for an hour, before taking another blood sample. Then came an hour’s massage . Immediately after the session a third and final blood test was taken. Compared to the baseline results, the results from the group after the massage showed a 70 percent boost in their white blood cells. This was a higher reading than they got from the volunteers simply relaxing. T.Lymphocytes do perform a wide array of functions in the body involved with growth and repair, which could, in part, explain why massage has been reported to help with so many conditions. ‘An experiment with a group of mice showed two separate groups of mice, one group who were stroked by hand for eight days. The other group were stroked with a brush. The mice who were stroked by hand had increased immune function. This did not happen when they were stroked with a brush. Today, therapeutic massage is one of the most popular healing modalities, proven to ease a wide number of complaints. When the therapist has true empathy and compassion, amazing healing can take place, with the power of touch. This enables your own body, which has incredible powers to heal, do the healing. Using Quantum-Touch techniques, we can create a high frequency of life-force energy. If we place this field of high energy around an area of pain, stress,inflammation or disease, the body can entrain to the higher frequency, this amplifying the body’s ability to heal itself. Professional practioners havee said how combining Quantum-Touch within their treatments has transformed their practice. There are proven ways this healing energy works on many levels. When the body receives a high vibration, it responds in whatever way it chooses to heal. Quantum Biologist Glen Rein Ph.D from New York has found that healers were capable of affecting the very winding of DNA. Energy really does follow thought. ​Our love has more impact than anyone knows, and when you learn to direct the life-force energy, the possibilities are truly extraordinary. Introducing the Quantum Touch Pendant! We're delighted to introduce a new product and a major discovery from Richard Gordon, Founder of Quantum Touch... The Quantum Touch Pendant! One of the new discoveries is a way to infuse energy/intent into objects. We can charge objects with life-force energy, and they not only hold the charge but can be used to relieve pain, accelerate healing, and much more. The pendants contain the best energy from Richard Gordon and practitioners, and help intensify the healing of a Quantum Touch session. Combined with our massage therapy, this pendant delivers an amazing healing experience. Call us on to find out more 07813 095066 or 07919 074170 to find out more. Muscles - Can They Turn Back Time. ​New research has shown the benefits of exercise on keeping the muscles healthy as we get older. The process of muscles getting smaller and weaker has not been properly understood before now. The journal of physiology suggests that muscle wasting follows on from changes in the nervous system. Elderly people typically, have around 30 - 50% fewer nerves controlling their legs. Parts of their muscles would be disconnected from the nervous system, and so they become weaker. There is a form of protection in healthy muscles, in that surviving nerves can send out new branches to rescue some of the detached muscle fibres. In older adults with large, healthy muscles this is more successful. When nerves are unable to send out new branches, it can result in extensive muscle loss. Researchers are still trying to understand why the connection between muscles and nerves remain healthy in some people, and not in others. There is currently research being done to look at whether regular exercise, as people get older, slows the process of muscles becoming disconnected from the nervous system, or improves the success of nerve branching to rescue detached muscle fibres. In Europe now, there are at least 10 million older people with low muscle mass, which is a medical condition known as sarcopenia. They are at higher risk of falling, bone fracture and disability, making them more vulnerable to falls. The research helps to explain why muscles decline as we get older, and discovering why, will help in the search for effective remedies. Th study lead author is Dr. Mathew Piasecki. We have observed some very old muscles with just a few dozen nerves left, where young and healthy adults have hundreds. The goal is to identify the best type of exercise, and to understand the physiology of why the nerve - muscle changes occur as we get older. Researchers believe regular exercise in both middle and old age could slow down this disconnect between nerves and muscle. There is no doubt that aerobic exercises like brisk power walking, cycling, jogging, dancing and swimming, really help with building up strength and stamina in the muscles. With Yoga you can expect increased flexibility, toning and strengthening. It is holistic, and the ancient science of yoga benefits, not just physically, but mentally, intellectually and spiritually. Keeping physically active throughout our life is very important, to help our bodies remain healthy. ​Valerie and Linda’s masssge skills are exceptional, and they put me at my ease straight away. After a couple of visits I realised how good I felt, so have been a regular client ever since. Good lucks and best wishes to Valerie and Linda in your new venture. Fifteen years ago my sister and I formed Valindas. We wanted to create truly wonderful healing massage therapies. 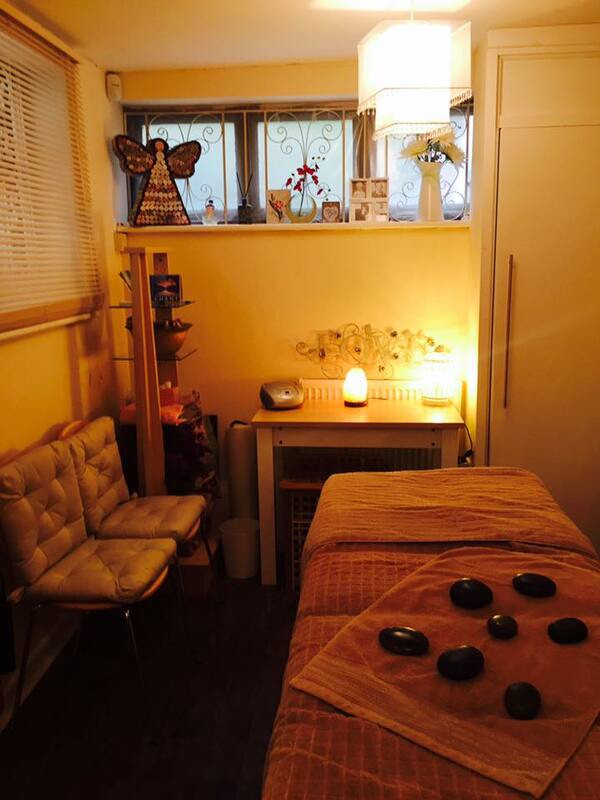 We felt that combining our energies would promote an even more powerful treatment. From our client feedback, it has proved extremely therapeutic. When a therapist puts their heart and soul into a treatment, amazing things can happen with healing the body. We investigated Reiki, but found something even more powerful. After doing some research we came across Quantum Touch. Developed by Richard Gordon, it was the ideal healing to incorporate into our massage treatments. Healing is a fascinating process which is generally very poorly understood. All healing is self healing. The body has an amazing ability to heal itself. Through Quantum Touch, the therapist can enable the clients body to heal, with its own healing process. When the breathing and the body awareness are linked together they are moving life force energy. This healing works alongside other therapies in an extremely powerful way. So many people have been grateful to us for the help we have given them through the power of touch. Special Offers for April and May. Deep tissue body massage treatments with Hot Stones and Quantum Touch. £40.00 for an hour. Indian head massage with back and shoulder Hot stone massage. £20.00 for 35mins. Contact Claire at the New Forest Tree of Life Gift and wellbeing Centre. Tel. 01202 801145. One of the best drug recovery therapies may also be one of the most cost-effective - massage therapy. Massage is different from the highly interactive therapies which are used in drug rehab. The patient is asked to contribute a lot throughout much of rehab. Massage is different, as it is a therapy that yields many benefits. Patients who feel stressed and anxious are strongly tempted to return to substances to ease those feelings. Massage therapy is very successful in reducing stress. In a study massage therapy was shown to reduce stress, it also produced a 16 percent rise in beta-endorphins. With less than an hour of therapeutic massage patients feel less agitated and more positive, without any substance use. This positive attitude helps towards a successful outcome with other drug rehab therapies. Massage therapy reduces stress and increases positive feelings. The power of touch helps patients focus on being calm. Massage therapy Also helps to release toxins from the body. Muscles are loosened and endorphins are released, the increased blood flow aids detox by nourishing tissues and increasing lymph drainage. Good chemicals are released and bad ones are washed away. Therapeutic massage can also reduce cravings and helps to lift depression and pain. Overall, a wonderful therapy for people on the road to recovery. Fibromyalgia is a chronic musculoskeletal condition expressed in widespread pain all over the body. Fibromyalgia can occur on its own or linked to stressful events, repetitive injuries, illness and certain diseases. Pain can be managed, and massage for fibromyalgia patients is one way to practice pain management. The following benefits of therapeutic massage have been proven to help fibromyalgia sufferers. Massage will help to improve sleep, as it encourages relaxation, allowing the body to repair and rejuvenate at night more effectively. Helping to restore and strengthen lethargic muscles. Improving mental clarity, raising healthy awareness and relieving mental stress. Improving blood flow to the brain can help relieve headaches. Massage can restore homeostasis of the body, diminishing the effects of anxiety and depression. Fibromyalgia can be hard to treat, so requires a team approach from a doctor, a physical therapist, and a pain or rheumatology clinic. Eating well, exercising and getting enough sleep also help. Many clients claim that regular therapeutic massage sessions keep their pain under control, and restoring strength and vitality to the body.